Where are you from? Your profession? I was a labor and employment lawyer, representing management, in St. Louis, Missouri. Retired, I moved to St. Simons Island, Georgia four years ago. When and how did you become interested in paddling? We live on the marsh with a tidal creek. I wanted to explore the marsh, so I bought an inexpensive inflatable kayak, kind of a plastic baby pool shaped to look like a kayak. So maybe calling it a kayak is like calling a time-share condo in Jackson Hole a “ranch.” But it was almost perfect for tooling around the creek behind the house. The “almost” concerns alligators. One day an alligator rose up right next to the kayak, dove, spinning the kayak in a circle. To get away, I became the Lance Armstrong of inflatable kayakers. I realized my kayak was a plastic balloon, as impenetrable for an alligator as cotton candy. One alligator nibble and it was thick heavy limp plastic, enveloping me, sinking. And I was food. As I write this I’m wondering if the kayak came with warnings: “Do not use in alligator infested waters.” Or maybe they just figured anyone with common sense would know that. Anyway, I then bought a 14’ kayak. Where is your favorite place to paddle? The Suwannee River. Which Paddle Florida trips have you gone on? The Suwannee five-day trip twice and the spring Suwannee festival once. I have only gone on river trips. Can you describe a Paddle Florida trip highlight? For me the whole experience is a highlight. On the Suwanee trip, you spend five days with really interesting people, a low-key friendly group with wide-ranging curiosity, interests, and experiences. And everyone is helpful. No one is showy. I’ve been on a lot of multi-day bike trips with a certain pressure to get up and on the road. With Paddle Florida, nothing is rushed. Everything is peaceful. You explore what is interesting, go ashore to explore and stretch. I enjoy the simplicity of camping and the irresponsibility of someone else doing the planning, feeding, carrying my stuff from campsite to campsite, my only “duty” being to kayak down the river. Osprey, eagles, red shouldered hawks, little blue heron, the omnipresent belted kingfishers. At night the barred owls talk a lot, calling back and forth. 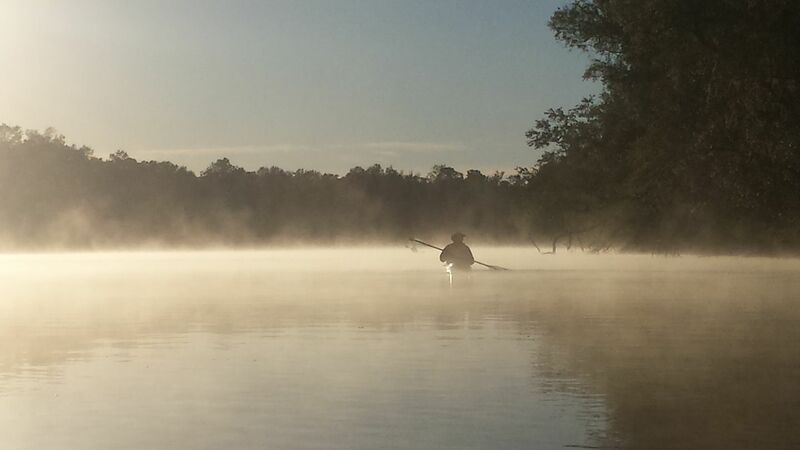 The mystical morning mist on the river. It’s soul cleansing. And you can’t get lost. What advice do you have for folks considering a Paddle Florida trip? If you enjoy being on the water in a self-propelled boat, sign up. Put aside all self-doubt and misgivings and do it. My first Paddle Florida trip began three days after we got back home from the Hurricane Matthew evacuation. I was stressed and asked myself what a novice kayaker like me was thinking of when I signed up for a five-day kayak trip. When I got home after the trip, I immediately signed up for more trips. I am truly a Happy Paddler! I love going on these trips. Also bring a layer of fleece or wool and a jacket and a pair of wool socks. Nights can be chilly. If you are a novice kayaker, make it known that you welcome advice and make it a learning experience. When someone tells you that your paddle is upside down, be appreciative.